One week til Christmas eve - hurrah!!! I wanted to make my kids something to wear on Christmas day. Using overtly Christmas prints on clothing isn't really my thing, but I still want them wearing clothes that are festive on the big day. I have previously made view B of the jump rope dress by Oliver + S, and loved it (everytime DD wears it we get asked where we got it). View A has been on my wish list for a while, so I thought I'd make one up for Christmas. I had a couple of yards of Sandi Henderson's apple dot in red in my stash, and the colours suit my DD and Christmas, so I decided to use that. As the print is quite busy I constructed the placket and collar in a plain cream cotton to break it up and frame DD's face. If I had enough fabric I probably would have made the sash up in cream too... But I didn't, so apples it is. The pattern was just what you'd expect from O+S - clear and easy to follow. This is quite an involved pattern though, lots of little elements that take more time than you expect (the placket, sleeve tabs, pockets etc). 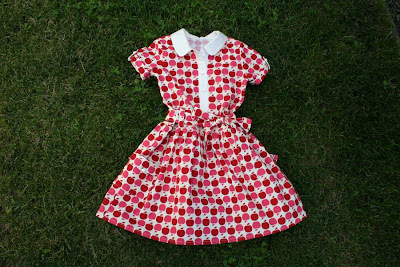 This dress took me three nights to make (one night cutting and another two nights sewing) so I am pleased to have it finished. I need to make my son something for Christmas now. 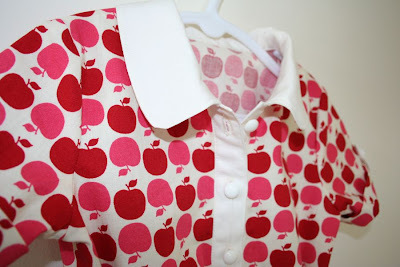 I am considering a sketchbook shirt in co-ordinating green apple dot fabric. What do you think - too naff? I am so tempted. The dress! I think this fits the brief of being Christmassy without being *too* Christmassy. Placket and collar constructed in cream. 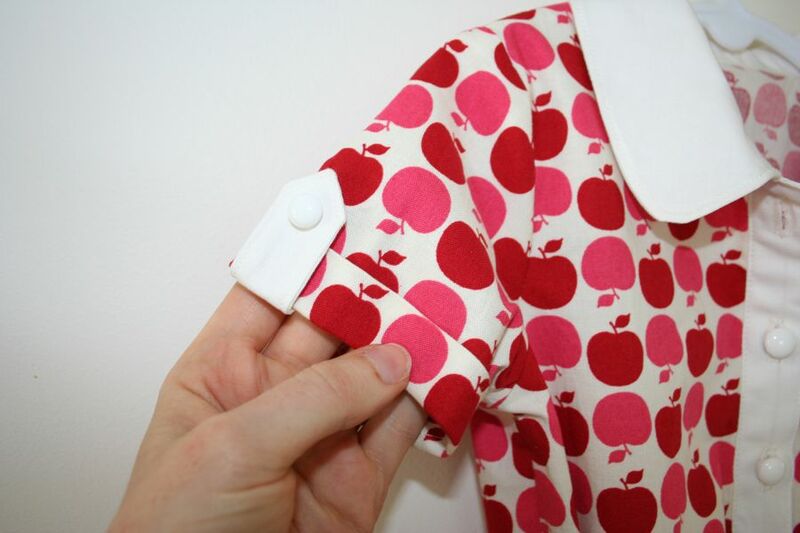 The buttons are the same white plastic button I used for the Swingset tunic. 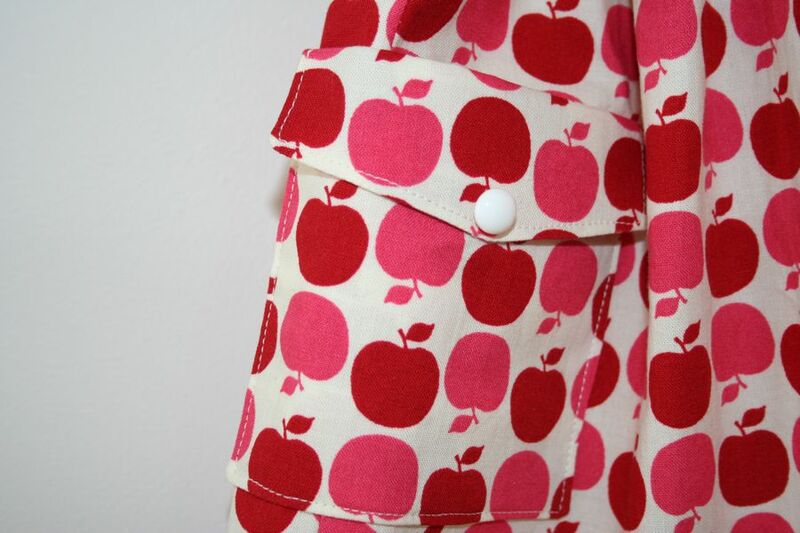 The sleeve tabs are made up in cream too, and finished with the same style of button as the placket, but smaller. I love these sleeves, so cute. They'd work well on a boys' shirt too I think. Oh wow, spectacular work! 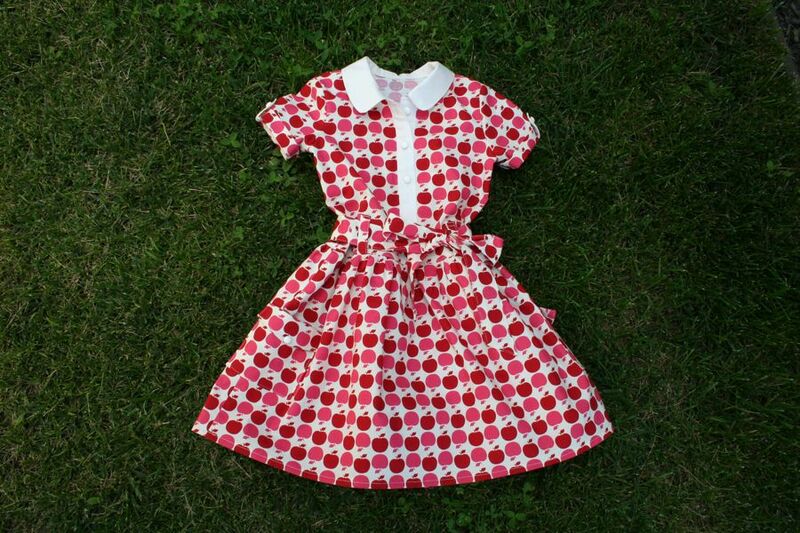 The coordinating shirt would look great next to this - do it! Absolutely delightful! I adore this fabric and its' stunning in this design! Claire you are AMAZING!! !